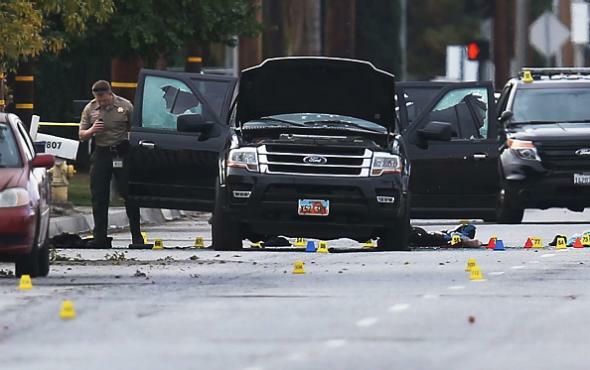 Law enforcement officials at the scene of a police shootout between San Bernardino massacre perpetrators Syed Farook and Tashfeen Malik. Update, 3:50 p.m.: The FBI is officially treating the San Bernardino massacre “as an act of terrorism,” it announced at a news conference, which means the federal government will lead the investigation into it. Though a Facebook post made by Tashfeen Malik on the day of the shooting seems to indicate that she and her husband were inspired by ISIS, there is no known evidence as of yet that the attack was actually coordinated with the group’s operatives. Original post, 9:48 a.m.: Here’s the latest news from the investigation into the Wednesday massacre in San Bernardino, California, committed by Syed Farook and Tashfeen Malik. The specific inspiration for the attack is nonetheless still not yet known. While it was reported Thursday by CNN that Farook had been in contact with more than one person suspected of terror-related activity by U.S. authorities, the network says there is no evidence that those contacts were directly related to Wednesday’s events: ” ‘These appear to be soft connections,’ an official said, meaning they were not frequent contacts. Farook’s last communication with the contacts was months ago.” Multiple outlets interviewed individuals who knew Farook, including some at the mosque he attended; none were aware that he had any history of behaving violently or using extreme rhetoric. Farook’s mother said in divorce papers that his father was a violent alcoholic, the AP reports: “Farook’s mother alleged in 2006 that her husband, also named Syed, attacked her while her children were present, dropped a TV on her and pushed her toward a car, according to divorce records.” The divorce became final this year. Farook and Malik were married in 2014; she originally entered the United States from Pakistan using a K-1 visa for fiancées and was subsequently given a conditional green card.